Tunicata once were thought to be a subphylum of the Chordata (containing all vertebrates: fish, amphibians, reptiles, birds and mammals). 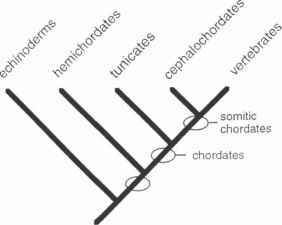 Now they are recognised as a separate phylum, sharing a common ancestor with chordates. At some time in their lives, tunicates (like chordates) have a dorsal nerve cord, a notochord (a rod of turgid cells that, in vertebrates, becomes the backbone), perforations through the pharyngeal wall to the exterior (like gills in fish), and a ventral thoracic gland (the endostyle) that secretes thyroxin (like the vertebrate thyroid gland). The notochord and muscles associated with it are in a larval tail that, in the majority of tunicates, is lost during metamorphosis (as a tadpole larva loses its tail and becomes a frog). Table 27.1 A possible chordate phylogeny (adapted from Schaeffer 1987). In addition to their chordate characters, a special feature of tunicates (from which they derive their name) is the acellular coat (the test) of tunicin. Tunicin is a material similar to plant cellulose and the only example of such a substance outside the plant kingdom. Also, intracellular reducing systems in Tunicata (generating acid on cell lysis) are unique in living organisms, as is the presence of large concentrations of vanadium in a significant number of species. This unique chemistry, together with molecular data, support the hypothesis of a long and independent evolution following an origin from an evolving chordate stem that successively gave rise to echinoderms, hemichordates, tunicates and cephalochordates. 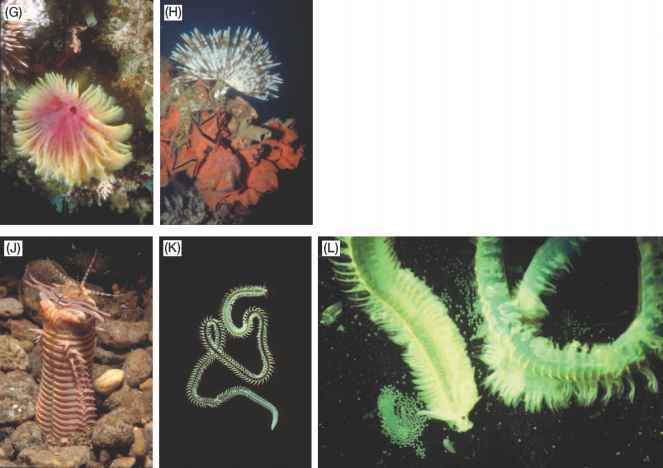 Tunicates, found at intertidal to hadal depths in all the world's oceans, are significant in marine ecosystems as powerful filter feeders, straining minute organic particles and bacteria from water they drive through filtering membranes. Their relationship to chordates confers on them a value as experimental organisms for investigations on chordate processes (such as immune reactions). Their unique chemistry has attracted the interest of the pharmacological industry as a possible source of novel biologically active molecules with useful clinical applications. This makes them the target of well funded bioexploration. Table 27.2 Characters of the Protochordata phyla, Tunicata classes and higher taxon Ascidiacea. Sessile, solitary or colonial, collagen branchial skeleton, ciliated tornaria larva sub-dermal nerve net. Active swimmers, myomeres, collagen branchial skeleton, dorsal notochord, no larva, groove in ventral mid-line, metabolising iodine, dorsal nerve chord. Thaliacea have an outer coat of the characteristic tu-nicin, a larval tail lost on metamorphosis and feeding currents driven by pharyngeal cilia through the filtering membrane (a mucous sheet covering the inner wall of the pharynx). In the minute Appendicularia, tunicin occurs only in small quantities in some embryos, the tail persists through life and its beating drives the feeding current through a filtering membrane in a mucous house that encloses the animal's trunk.